Grant Leadbitter skippered the Boro side as boss Tony Pulis took the chance to give more of his squad welcome pre-season action. Boro were in front in the 13th minute after good work from Lewis Wing on the left flank, before he sent over a fine cross for unmarked ex-Sunderland loanee Ashley Fletcher to head home. Harry Chapman shot over Rochdale’s bar before Britt Assombalonga was denied by a fine Josh Lillis save after a lightning quick Boro break. Lillis keput out another Assombalonga effort before Chapman doubled the lead early in the second half, firing low into the net after an inch-perfect ball from Fletcher. Rochdale got one back in the 68th minute as Calvin Andrew rose to head home a right-wing cross. Brad Inman equalised from close range on 85 minutes, then League One Dale snatched victory in the final minute, with Oliver Rathbone converting at the second attempt after a fine save by sub keeper Connor Ripley. Boro first-team coach Jonathan Woodgate told mfc.co.uk: “I don’t like losing, my message in the dressing room was as simple as that. “Friendly game or not, we need that winning mentality. “It’s a big lesson for me and it’s a big lesson for the younger players. “You can be the best player on the pitch for 86 minutes, but you make one mistake and you can be the worst – that’s what some of the younger players need to learn. Boro’s final friendly is at home to Sunderland on Friday. Rochdale: Lillis, Ntlhe, McGahey, Williams, Andrew, Williams, Thompson, Perkins, Adshead, Cannon, Henderson. Subs: Rafferty, McNulty, Camps, Rathbone, Wilbraham, Inman, Finnerty, Morley, Wade, Gillan. Middlesbrough: Konstantopoulos (Ripley 46), Mahmutovic, Wood, Fry, Johnson, Leadbitter, De Sart (Liddle 81), Wing (Pattison 67), Fletcher (Walker 74), Chapman (Cooke 60), Assombalonga (Spence 80). Sub: Braithwaite. 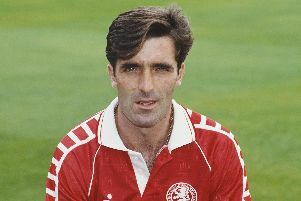 Grant Leadbitter (pictured) skippered the Boro side as boss Tony Pulis took the chance to give more of his squad welcome pre-season action.